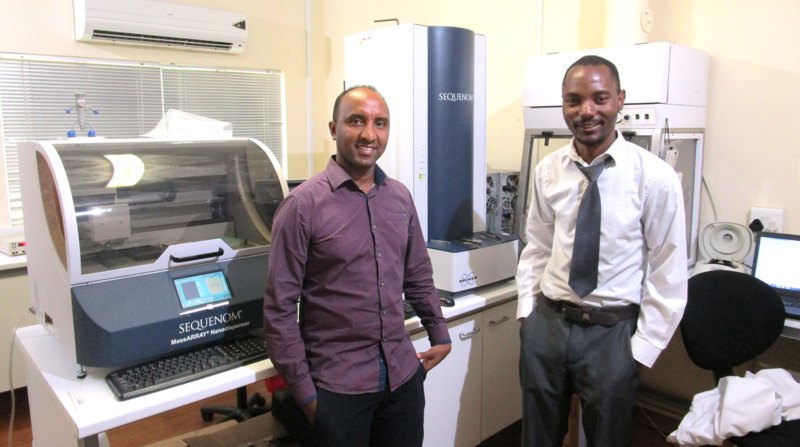 Aron is inqaba biotec’s Technical Support Manager and about half of his time he spends on the MassARRAY service. Aron originally comes from Eritrea and completed his undergraduate study at University of Asmara, Eritrea. He came to South Africa to do his Honour’s Degree in University of Cape Town in 2001. He stayed at University of Cape Town for his Masters in Genetics, his PhD in Medical Biochemistry and also did a five year postdoctoral research on Kaposi ’s sarcoma. Part of his PhD was performed abroad at the British MRC in Edinburgh, UK. Aron was looking for a change towards industry and therefore, he joined inqaba biotec in the beginning of this year. As a Technical Support Manager, he answers customer questions about any of our products, he tries to help with any troubles and gets in contact with our suppliers if necessary. Furthermore, he performs research on new products to inform the sales team and to be ready for any questions. Besides the technical support part, Aron supervises the MassARRAY department. He stays in contact with scientists and designs projects with them and Lembe. Aron is happy to be able to combine his interest in science, industry and travelling in his job. As already mentioned, the second part of the team is Lembe. He grew up in Zambia and went there to high school. Due to excellent performance, he was able to come to South Africa to study at WITS. Now he holds a BSc in Chemistry, Genetics and Biochemistry, an Honour’s Degree in Biochemistry and a MSc in Molecular and Cell Biology. He already wrote a scientific publication and also spent some time at Harvard University in the US during a summer program. Lembe joined inqaba biotec as MassARRAY Operator right after the end of his studies, 8 months ago. Besides the project design, his job is also to improve the service and perform all the bench work. The steps include DNA quality control, PCR amplification, Chip Coating, Mass Analysis and finally Data Analysis. Lembe enjoys interacting with customers, to get involved into their different research project and help them to reach their goals. His hobbies are playing Chess, Basketball and Soccer and his dream is start, at some point, his own company.